So I have had 2 friends in New Zealand wicht sort of left me out but we made friends and I treasure them but now I made 2 more friends in the US and one of them is a title jurke to me the other is nicer but not by much most of the time I like to have a friend but I am not surprised that this has happened again. And to make it worse I fell like some other people put me down for who I am. So my “Friends” where doing truth or dare and you know what would happen. Later I broke up with those “friends” and they made friends with the meanest girl in the class. 😑 then they started to take the lunch basket bown to the lunch room and up to the classroom for about 2 hole weeks I noticed I tried to stand up to them but they were just put me down and still took the lunch basket. When I told my mom she just disapproved of me so that made me sadder and then the boys stood up to them and sat right next to the backet and the girls didn’t complain. When I told mom she just said that need to happen. Now imagine how I felt you would probably feel the same way . last night I had a horribly day and then I got yelled at by my family but later dad came into the room and said hey let’s play carcassonne ( 😍😍our fun Ipad game) but then the boy would want to play and just insult me so dad said that we could start are own game I felt better after that. Next morning I had not spoken to anybody and had to go to the bathroom but I was having a dream but I had to so I did and guess what while I am washing my hands when the boy barge in ( we share a bathroom😑😢😭😭) and is like you have to put this on and this I had not yet flushed and the boy yelled at me for not flushing the toilet and that hurt my feelings that my own brother can’t give a thought about my feelings. And then the girl that hates me started t take a bout my crush when he was siting at my table blarrrrrggggggggggg stupid girls.I still hate her but that could change. On Wednesday I came home and I finished my homework. I went outside to play with my brother and then I played with two other girls in my estate. We just skated around the Estate and had so much fun. And I saw one of my classmates then she joined in with a Polish friend. Everybody’s from Poland! When I went inside I had dinner and couldn’t wait for tomorrow. Then I had even more playdates. I love having my nails done. Something about it just makes me feel like even if the rest of me is falling apart, at least I’ve got one little piece that’s put together. Most of us have something like this, whether it be having our hair done, or having a book with us at all times, or wearing a hat, or having a notebook or what have you. 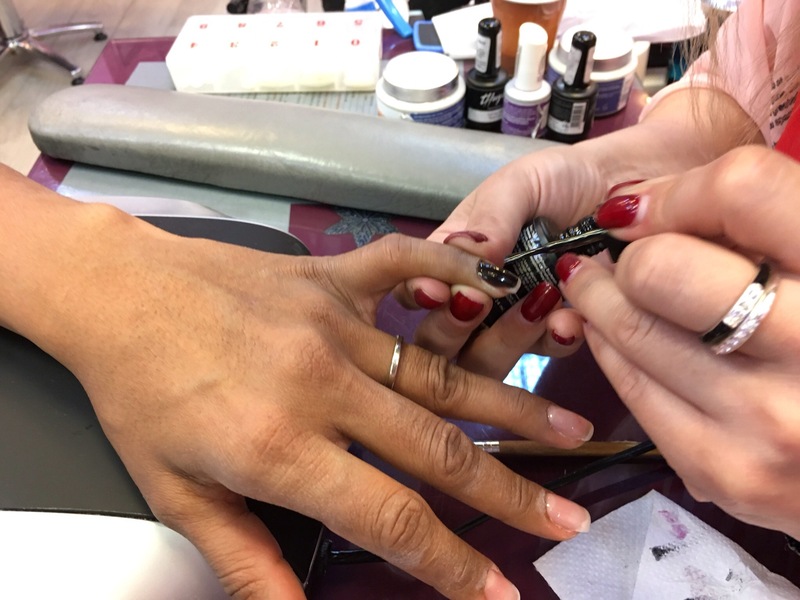 I had never had a real manicure until medical school, when my friends Rebecca and Doosa, upon learning this, looked upon me with wonder and pity and promptly booked an appointment. Since then I’ve never looked back. Frivolous, I know, but there you have it. 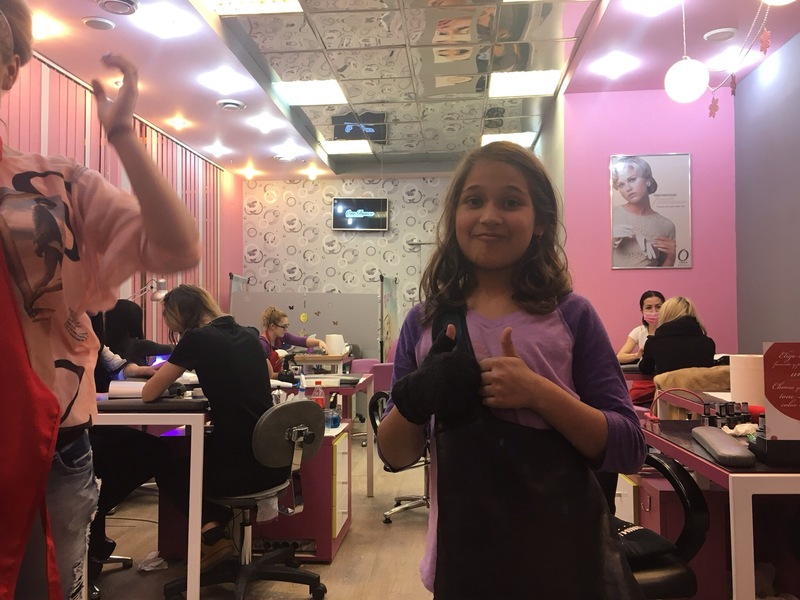 When we arrived in Romania, one of my first orders of business was to find a nail salon. At first, I was so intimidated by this, as I often was when we first arrived here. I didn’t know if there was different etiquette here, or how to communicate exactly what I wanted. I ended up choosing a place at the mall with good reviews and walked over. Inside was a clean area, lit with bright lights, six or seven nail stations at which were seated women in various stages of nail perfection. All turned to look up at me as I walked in and chatted with the receptionist, which made me feel a bit like a spectacle. At the far end of the room was a tv bolted near the ceiling playing pop music videos in English and Romanian, lending an air of familiarity to the place. As they were busy, I made an appointment to come back to have a manicure with someone named Carmen. Now, I actually know a Romanian Carmen at home, and she is no one to be messed with. I was soon to find out that neither was my new nail tech. I went back at the given time and sat down in the chair, and was offered a cafe which I accepted. Carmen sat down across from me, a serious looking young Romanian woman with crimped bleached blond hair. Not saying much, she began to inspect the state of my fingernails. They were somewhat of a disaster. Some had broken off nearly entirely, others were cracked. Her eyes widened, the corners of her lips pursed and she held up the stubs and said, “What can I do with this?” “Well, just leave them and they’ll grow” “It won’t look nice,” she admonished, “I will have to cut them all.” Foolishly, I thought I would still be able to get my way and said, “No no, just leave them.” After a few minutes of shaping while continually sucking air in through her teeth, she stopped. Holding up my fingers in front of me again, she said sternly, “Do you see, it won’t look good! When I do a job, I do it from my soul! I want it look very nice for you.” Okay, okay, I acquiesced. I mean, I didn’t want to be responsible for a stain on Carmen’s soul. This was also the moment when I knew I really liked Carmen. Anyone with that degree of decisiveness is always a winner in my book. Out came the clippers, efficiently slicing all the nails down to fingertip length. I have to admit, she was right and they did look better that way. I later tried to tell her only to cut the cuticles a little bit, but again this didn’t go far. After one round with nippers, there was another round with a pair of very sharp scissors. Enough dead skin piled on the table in neat little strips that I thought it could be an effective weight loss technique if done on a regular basis. Intermittently during our first appointment, we would have a conversation in broken English. I learned she had a six year old daughter, I told her about our time in Romania and our travels. 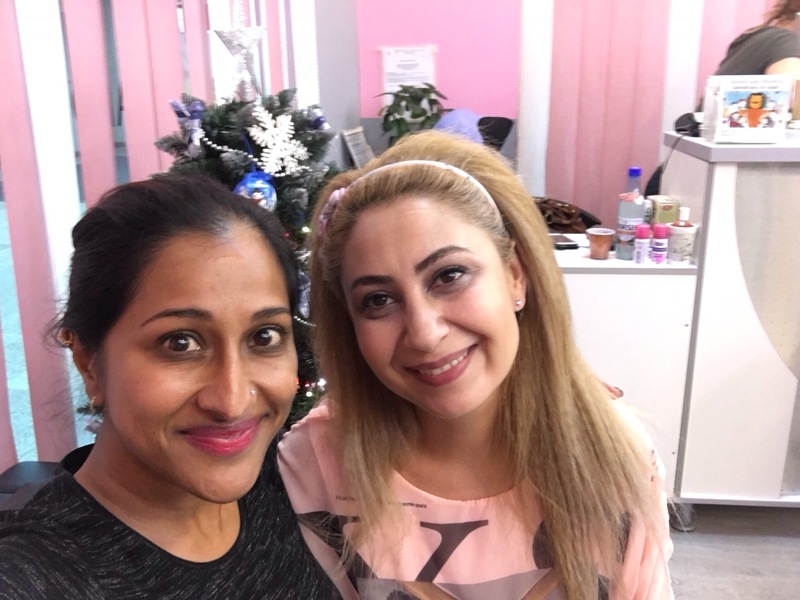 Around the shop, the nail techs chatted amongst themselves in cheerful Romanian, clearly trading gossip and ribbing each other in a friendly way. Every now and then Carmen would shake my hand gently and tell me to relax, which happens to me every time I get my nails done. After the fifth time of this, she threw her head back and smiled and said “Oh my god!” In a rather amused, exasperated away. The color I chose was a difficult one, requiring several coats to become opaque, unlike the usual two. Later on, I asked for a design on one of the nails. She brought out a big set of stamping plates and laid them on the table as she continued to work. I saw a nice little feather design I thought would be cute and waited until she asked me what I wanted. This time was not to come. “I choose for you,” she announced, poring over the plates until she made her decision and then stamped a nice little wavy design on. It was quite nice, actually, and our visit ended with a picture of my hands for her portfolio. Soon it was time to go back, and of course I booked with Carmen. I had to again face the disappointment in her face when she saw another few broken nails. Sighing heavily, she brought out the clippers to cut the rest of them down. She offered to make one of them longer instead, but I declined and opted for the cut down. “What color do you want?” She asked with trepidation.”Not the same one as last time?” Clearly thinking of how long that one took to go on. “No,” I said, “just black this time.” “Black?” “Yes.” “Okay, if that’s what you want,” her eyes widening slightly and with a upturned tone to her voice at the end of the sentence, in a way that made it clear I was unwise to want this, but this time I felt pretty sure about it and didn’t give in. This time we chatted a bit more, and it was nice to be in the midst of a pleasant sussurus of women’s voices in the clear tones of gossip. This time I was allowed to choose one of my nail designs and she picked the other. The last time I went in was yesterday, the girl accompanying me as the boys had other plans for the day. When I’d made the appointment a few days ago, the receptionist knew me and immediately turned to Carmen’s schedule to see when she was free. On arrival, I was greeted warmly by the staff and then again tutted over by Carmen for the sorry state of my broken off nails. I showed her a picture of the polish pattern I wanted, and she said definitively “I will have to do a few tips.” Now, I’m not usually one for fake nails of any type, and the last time I had them may have been my wedding, but by now I learned that Carmen knew best. Besides, since I’m not working I figured there was little harm in it for now. (Medical providers usually aren’t allowed to have any type of fake longish nails because of the increased bacteria risk, but moreover it’s entirely impractical. I mean, I don’t think my patients would take kindly to being stabbed during an exam.) She turned to her colleague and they had a rapid discussion in Romanian about the best way to achieve this, and ten minutes later I had a full set of perfectly long nails. My daughter peppered her with questions about the process as we went on, clearly not approving of the nail tips, narrowing her eyes at me as they went on. Then a discussion on how to achieve the french manicure type look I wanted, only with black and gold. She painstakingly applied the polish so it would be perfect. One one nail I wondered if a stripe could be thicker. “It won’t look good!” She rebuffed. And that was that. When she was nearly done, about an hour of work later, I said to her as a joke, “Uh, I don’t like this color, can you redo it?” She looked at me with her eyes wide, mouth partly open and nostrils flared in a “Oh-no-you-didn’t” sort of way, and I burst into laughter “I got you!” And we both laughed about it while she related the story to the tech next to her in Romanian. 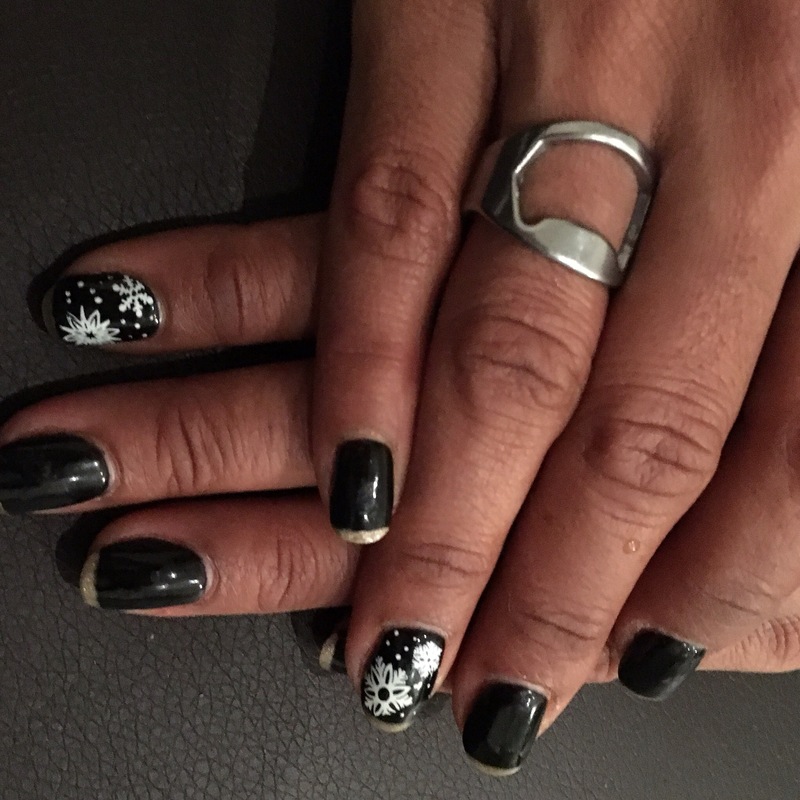 At the end, she said, “I want to do a design for you.” And pulling out a plate of snowflake patterns she applied them to my nails as she chose, with the overall effect lovely and seasonal. I told her we were leaving Sunday and we hugged. It’s a small thing, like I said, but these interactions are what make me feel like we have a sense of community here in Romania and things I will truly miss. The evolution of my experience at the nail salon reflects my overall experience with Romania. Initially nervous, then more comfortable and even welcomed. After being on the road for several weeks and feeling unrooted, we come to this unlikely place and end up finding places where we have friends, make connections. Viniloteca, the local bakery where we pop in nearly daily, the gym, the nail salon. I finally feel like I have a general sense of how things work, and don’t feel quite so nervous about trying to interact with people. Not surprisingly, this means that the people I interact with are generally friendlier and more open that I found them at the beginning. I suppose in a way this means we’re all mirrors, that someone has to be the first one to open up and smile before others can. 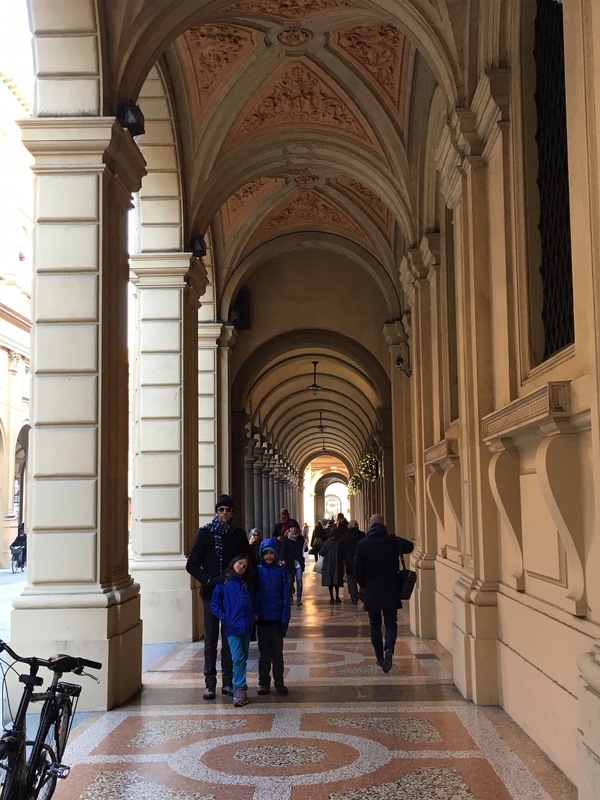 The last stop on our tour of Italy was Bologna. There is a study abroad program there where Regis sends students and Eric knew the program director who had invited us to come and visit. We were greeted warmly by Vittorio, the assistant director of the program and settled in. 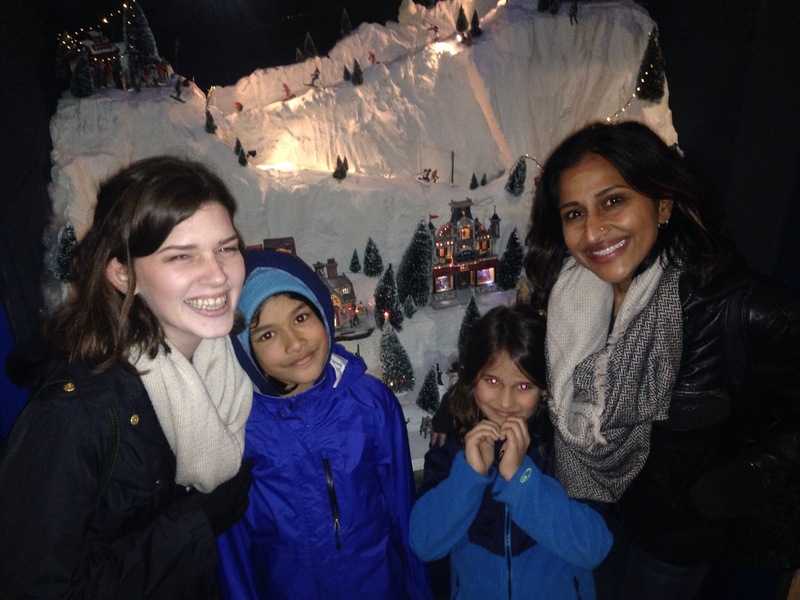 He showed us around and we saw something that made us all gasp in joy – a CLOTHES DRYER. We haven’t seen one since we left, as they’re not standard anywhere else. Given that in the dampness of places we’ve been, clothes take at least 36 hours to dry, this was a true luxury. 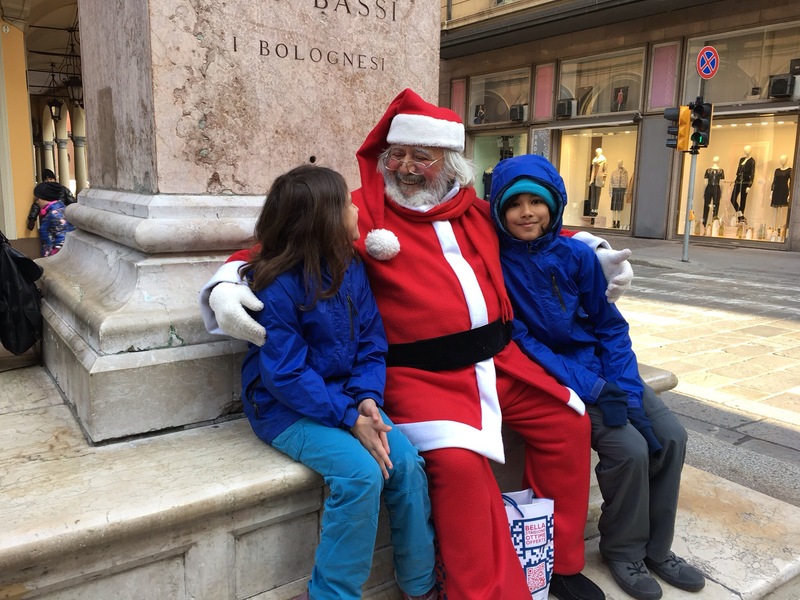 It’s Christmas season here, and in Europe that means Christmas markets set up around town. 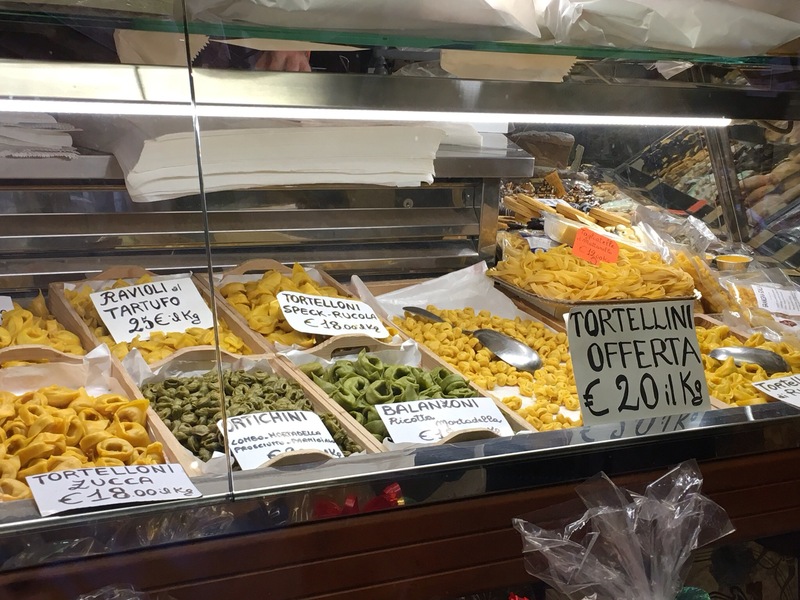 I went for a little walk on my own to find a grocery store to pick up some food for the night, and found that the one right next to our flat had handmade tortelloni for sale. I bought a kilo of fresh spinach and ricotta tortelloni, a jar of fresh pesto from the store and settled in for an easy dinner at home. When I was walking around though, I began to have something of an anxiety attack. I felt suddenly very alone and vulnerable, and scared. I had no reason to feel this way – there were plenty of families milling about and I didn’t feel in danger of my safety or anything, just…nervous. It felt strange to me, as I’ve traveled solo quite a bit in the past. I remembered the same sensation when we first got to Romania and Eric had to go to Bucharest for a few days, leaving me alone with the kids. Walking around felt terrifying to me. Now, of course, Romania is familiar and I’m often going about on my own. I think part of it is that for the last few months I’ve rarely been alone at all, usually at least with the kids if no one else. It was also the lack of familiarity, the lack of language as well. By the end of our few days in Bologna this was gone, and I had little problem being on my own, out and about. But it was humbling to realize that even with all the travel, I still get overwhelmed with the unfamiliar. The following day we didn’t do much to tell the truth. After the intense whirlwind of the last week, we spent nearly the first two full days hardly leaving the flat. 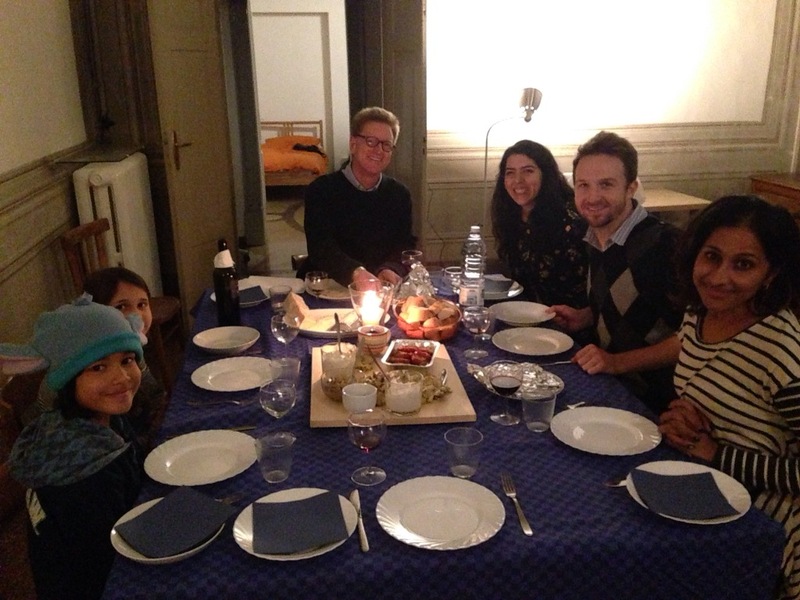 We met up with Vittorio, his wife Margherita, and their daughter for lunch at a tasty vegetarian restaurant. The girl was so, so happy to have another girl to chat and play with, as it’s been practically all boys everywhere else! We then relaxed until dinnertime where we were treated to a delicious homemade dinner made by Todd, the director, and hosted by other faculty at the university there. It was so kind and welcoming of them to have a dinner for us. Next day, Todd took us on a tour of Bologna. Bologna is a small, delightful city. While there aren’t many famous “sights,” the atmosphere is lovely and we felt warmly welcomed everywhere we went. At one point, the city needed to increase it’s living spaces. It did this by building additions onto buildings and underneath them, constructing porticos, or covered walkways, throughout the city. 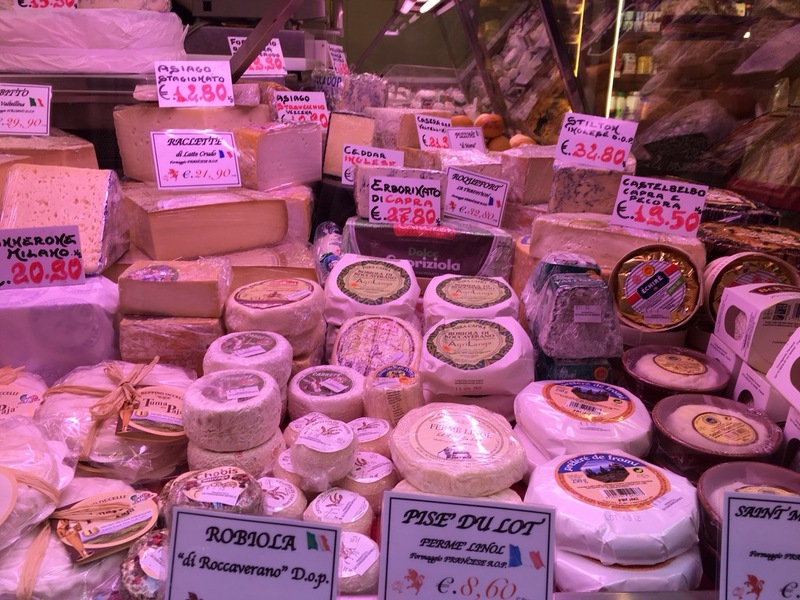 Bologna is known for its rich and tasty food, and in this it did not disappoint! 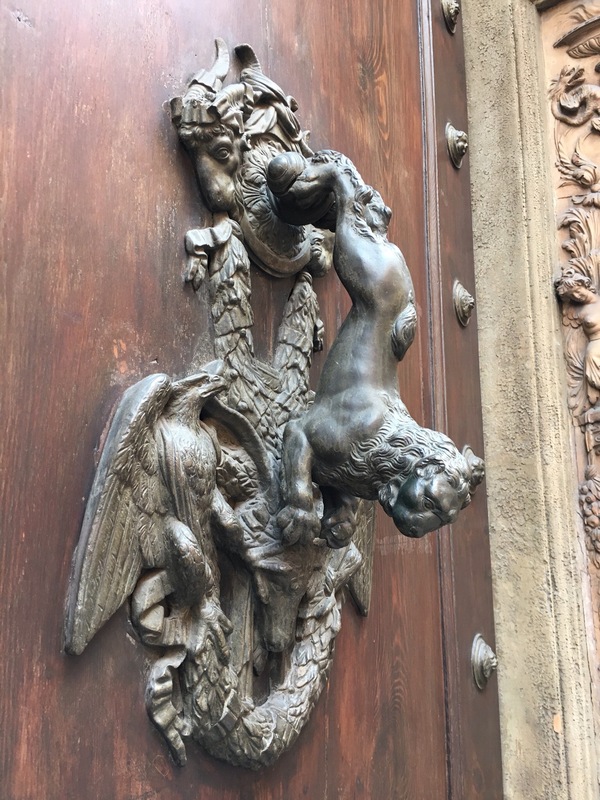 One of the interesting sights to see was the campus of the first Medical school in Italy. 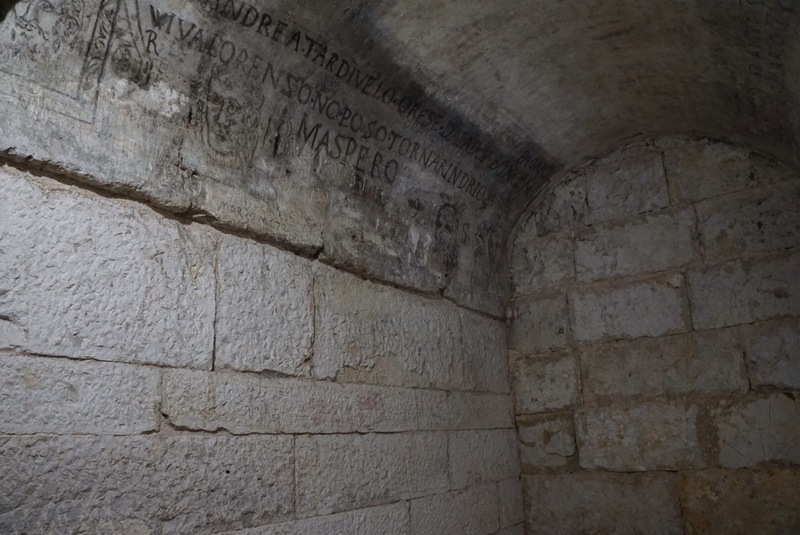 The walls are covered with names and coats of arms of the prior graduates. 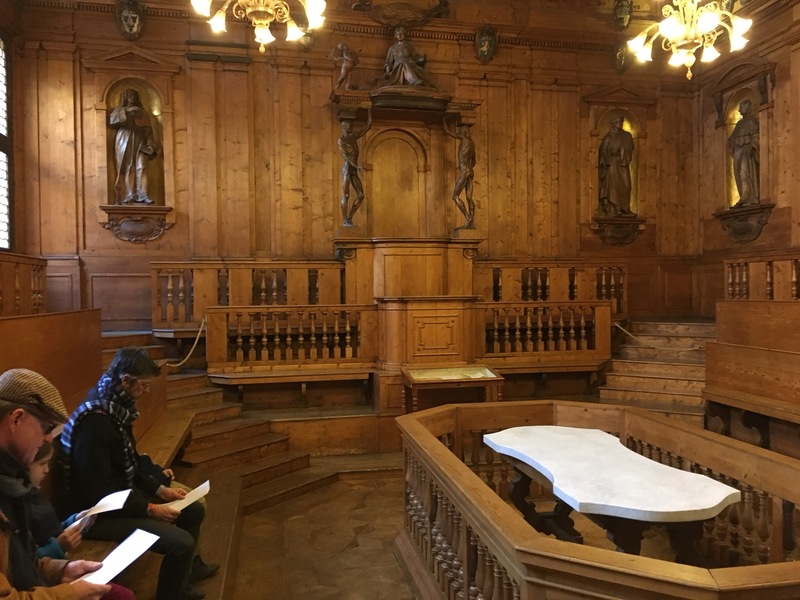 Inside is a dissection chamber, where students would sit on the tiered chairs while a cadaver was dissected on the marble slab below. Eric suggested I lay down on the slab to recreate a famous dissection scene. Was this a veiled threat? I wondered. I’ve been watching my back ever since. 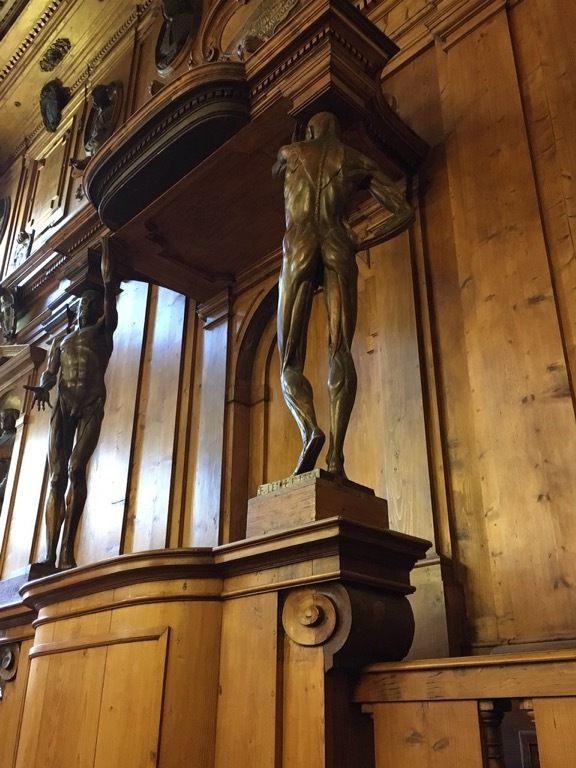 The columns of the lectern are carved with flayed nudes, in homage to the work done below, though are rather grotesque. 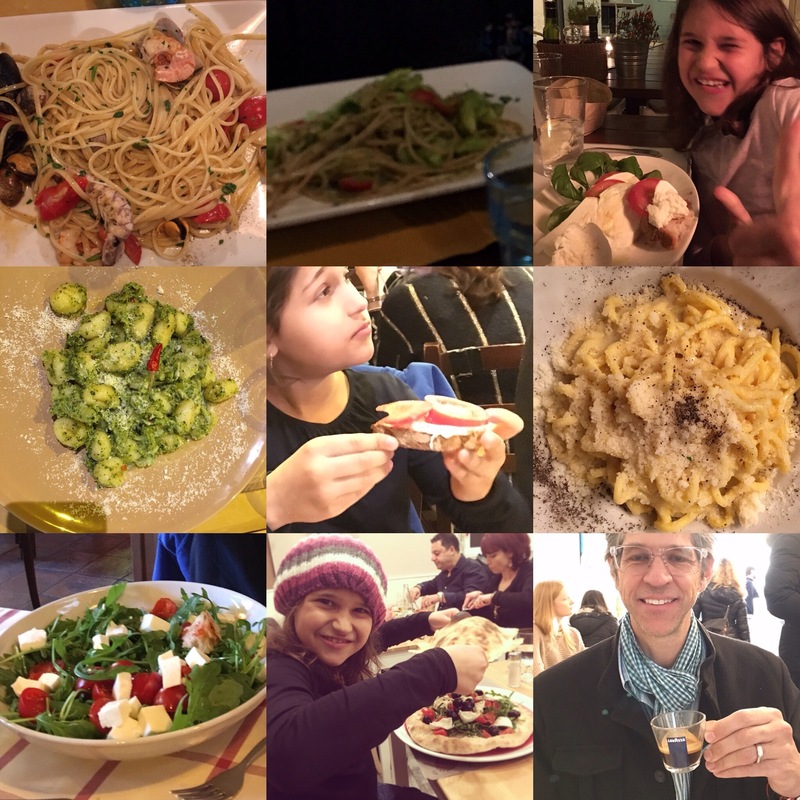 That evening we went out to dinner with Adleigh, and she took us to her favorite pasta place in Bologna. This was incredible. All fresh and handmade pasta with the perfect complementary sauce, followed by gelato for dessert, of course. For our last full day in Italy, we met with Margherita and Vittorio again for breakfast. An interesting conversation about the referendum in Italy – there was a big vote about amending the constitution significantly which failed, and the Prime Minister resigned. It’s seen as another big anti establishment vote, continuing the momentum of Brexit and Trump. In the States, we are myopic in our political knowledge, and I doubt that even many educated people could name five European leaders. I certainly couldn’t before I came here. The last Italian PM I could name was Berlusconi, turns out he’s been out of power for a while. I know Angela Merkel, but that’s because she’s been in power forever. Of course, everywhere else, they follow the US elections closely and have opinions on them. This is what privilege looks like, in this case American privilege, the ability to ignore what’s happening in the rest of the world because you know it doesn’t affect you all that much. For the rest of our time, we did little more than walk around again to explore the streets, pop into little shops and then dinner at home with some fresh pumpkin ravioli picked up at the Christmas market around the corner, where Adleigh and Sean, a faculty member, came over for dinner and some fun conversation. The next day we boarded our plane back to Romania, which we all now think of as home. 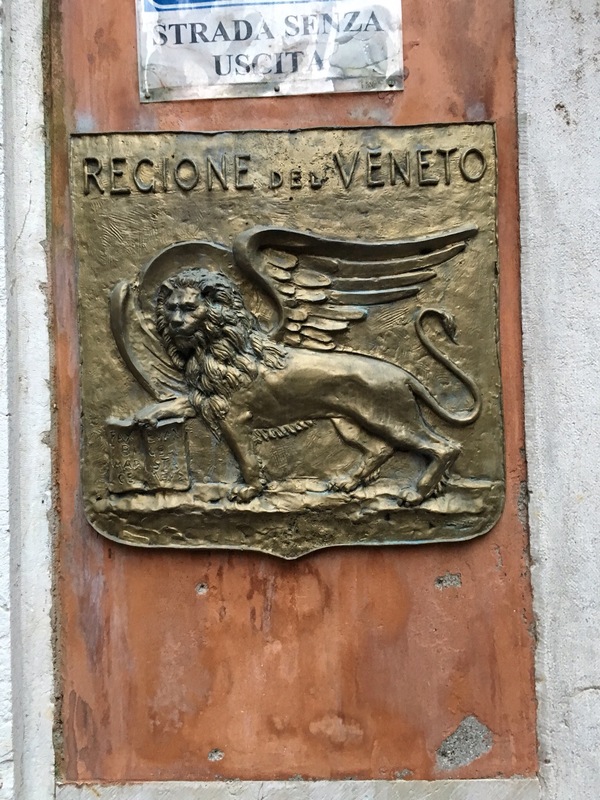 I usually end my region sections with the street signs, but they really aren’t that unusual here other than the one gondola one in Venice, so instead I leave you with a roundup of our culinary experience. Venice, I think, suffers from what you can call anticippointment. All the lovely pictures of it, the hushed tones in which prior travelers speak of it, you expect to fall in love at first sight. And while it is indeed very charming in a way, it’s also so overrun with tourists that there is currently a 7:1 ratio of tourist to resident. Much of the time I was in Venice it felt like an Italian Disneyland, a picturesque city with its unique canals, there for tourists to take pictures of and party in, more than a feeling of true culture and interest. Many of what I suspect used to be small local stores have turned to selling the same cheap chinese factory produced crap as everywhere else because that’s what makes enough money to pay the inflated rent. That said, it is spectacularly pretty. No roads, no cars, and no bicycles, the only way to get around is to walk or take a boat. 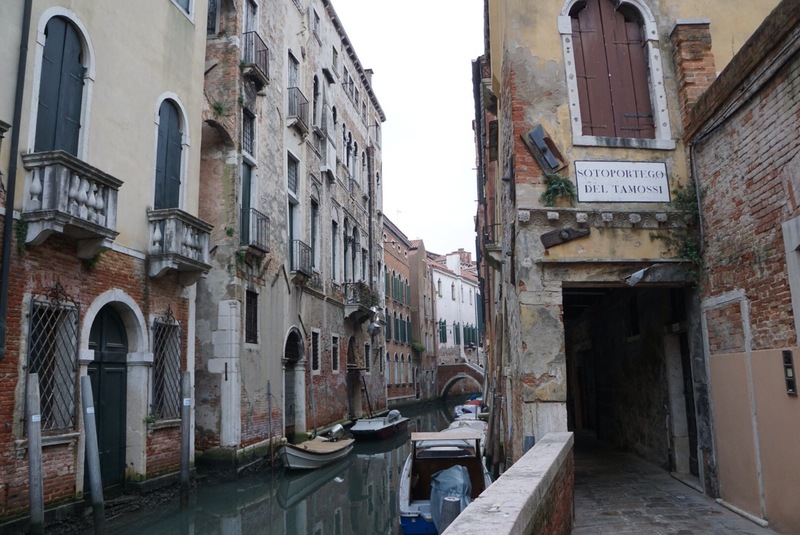 The narrow canals and bridges between buildings are something to see and experience. Our first evening there we decided to go for a walk around, just to explore. Our Air BnB host had suggested a small wine bar that had been in operation since the 1400s, and we popped in for a beverage. I love the little paths that just end in water, and the small little shops and bars you can find around. It’s verifiably labyrinthine however, and even a good map isn’t much help. The streets turn this way and that, going directly straight is impossible, and it’s hard to keep your bearings when you can’t see anything in the distance. We got entirely lost on our way back home, only finding our way by using Google maps and the compass app on our phone. We awoke to visit the main tourist sites, the palace and St. Mark’s basilica. The cathedral is, again, stunning, this time interesting for the Eastern influence on the artwork inside. Instead of painted frescoes, the ceiling is entirely covered in glittering mosaicwork. Instead of the usual Western style cupolas which have straight walls then meet to a point at the top, these are Eastern with bulges in the middle, think like the Taj Mahal. No photos inside, unfortunately. 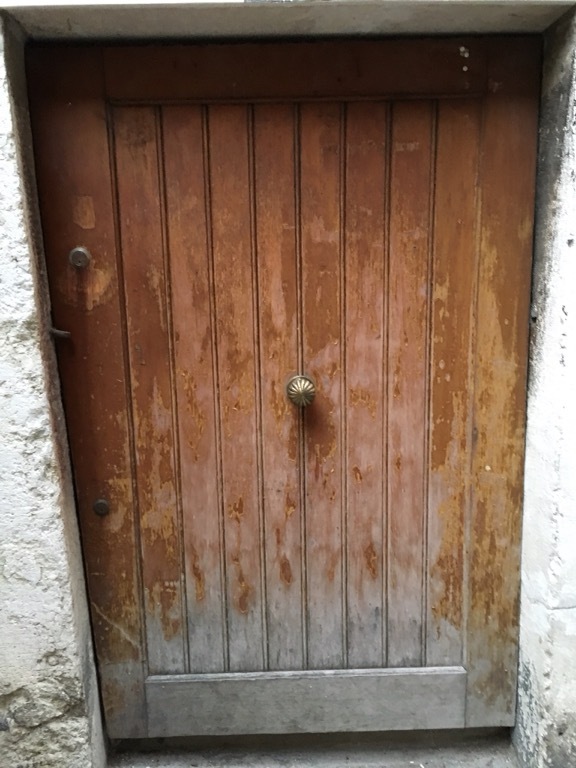 We went to the palace and signed up for the “secret spaces” tour, which takes you into the jails and torture chambers hidden in the walls of the palace. 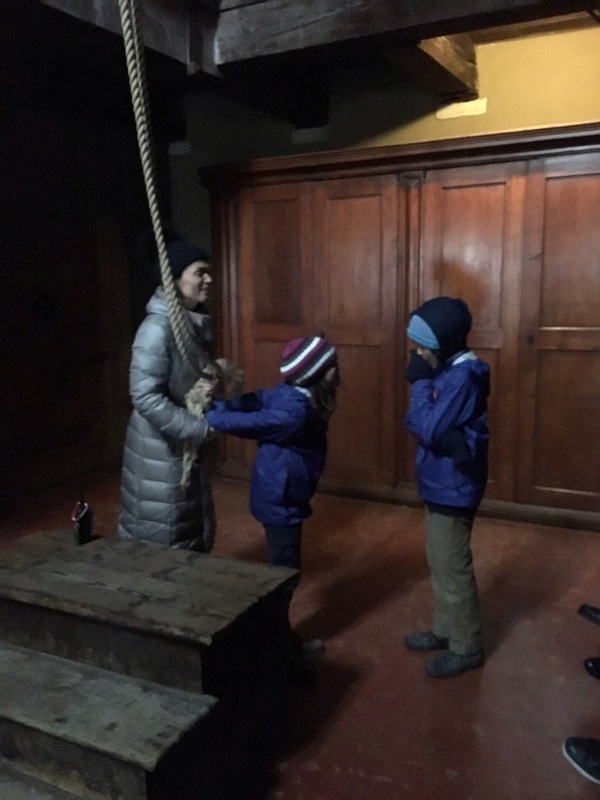 The kids got to reenact scenes of torture, perhaps a bit too delightfully. We learned of the history of Casanova, who was jailed in that prison for quite some time before managing a daring escape. 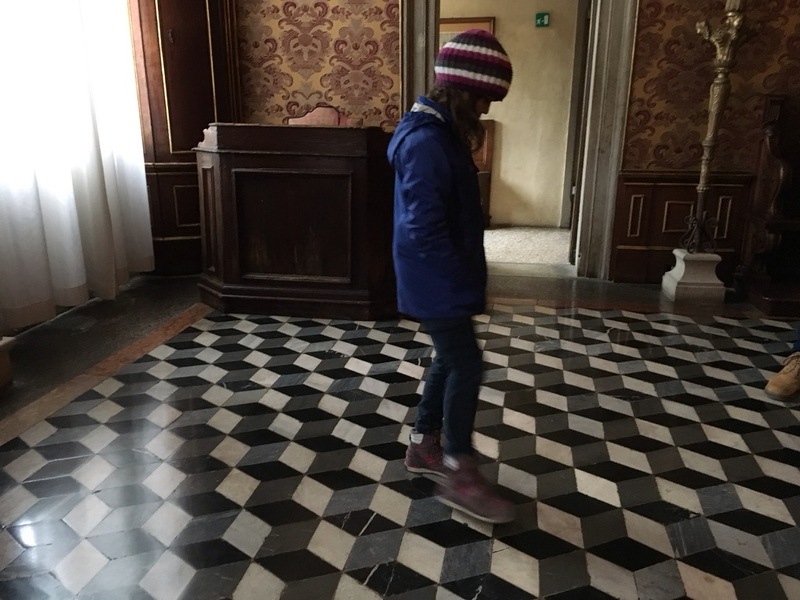 We saw rooms of inquision, floored with dizzying tilework intended as a mental game to disconcert the accused. 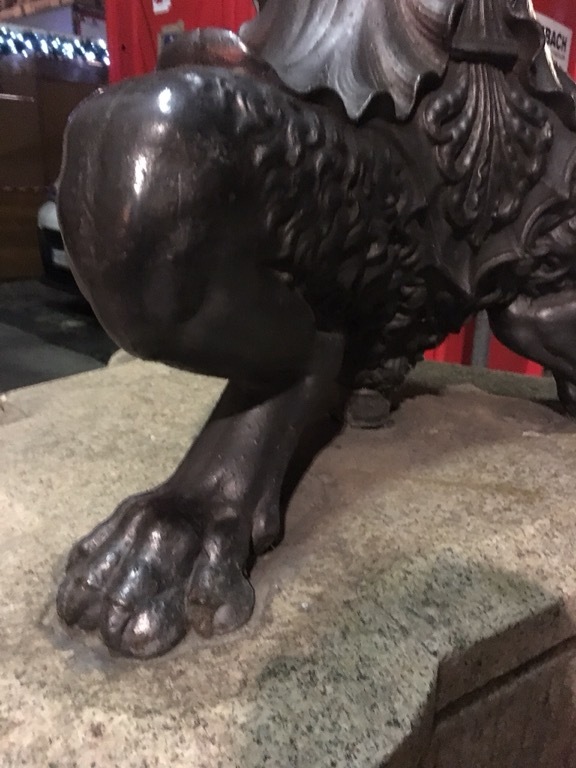 Our tour guide was sprightly and engaging, but it couldn’t change the fact that a 16th palace’s dungeon has poor insulation and we were frigid by the end of it. We warmed up with lunch and I tried an aperol spritz, a drink of campari, sparkling wine, sparkling water that is touted as a local specialty. Friends, I wasn’t impressed, though it could just be that it’s a summer drink and what we really needed was some nice mulled wine. 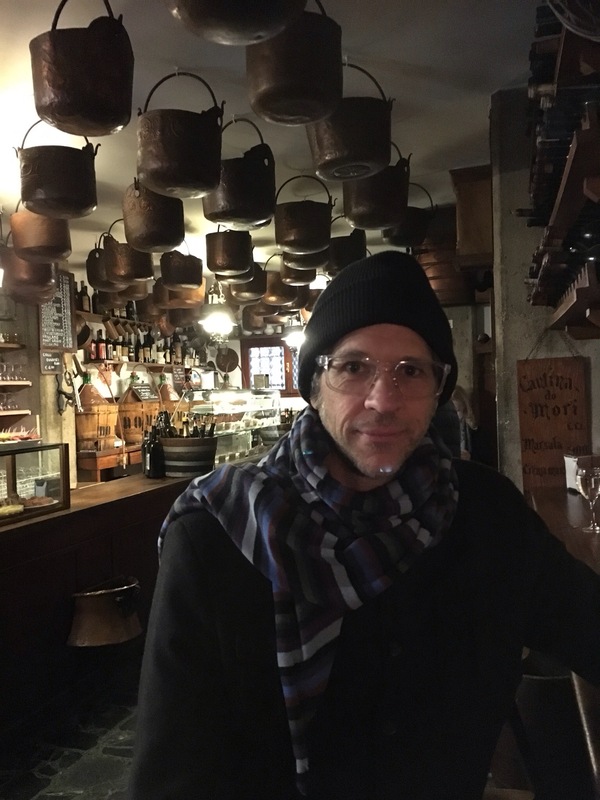 The drink was garnished with an olive, and when the owner came to take our glasses away, he gave Eric a stern look as he had not eaten the olive garnish. Eric only cares marginally for olives, and so smiled and said “no, it’s okay, okay to take the glass.” The owner continued his stern look and pointed at the olive. Keeping eye contact with him, Eric slowly took the impaled olive out of the glass and ate it, the owner responding with a satisfied look and a hint of a smile. I made a point of showing him that I was eating the olive in MY glass, which was clearly the right path to take. We considered a gondola ride for all of ten seconds. At 80 Euro for 30 minutes, it’s not a cheap proposition. 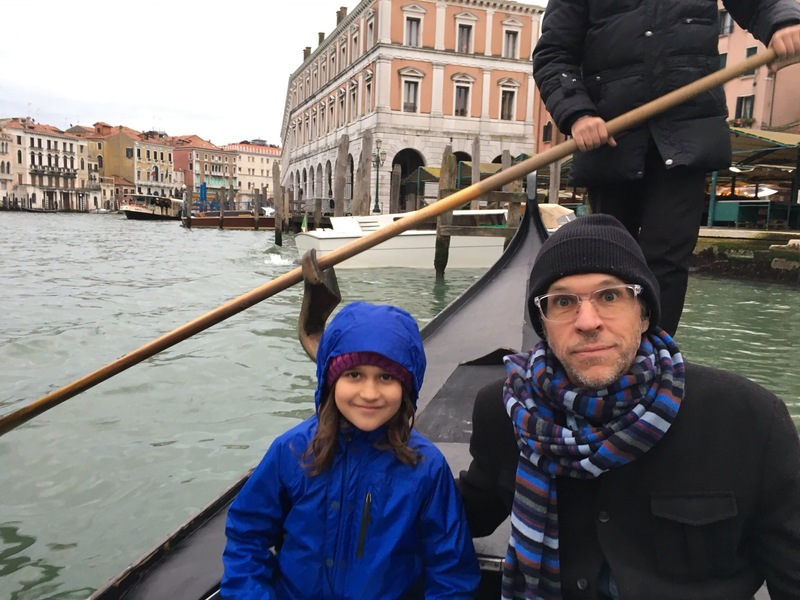 Also it was freezing outside, and I could only imagine 30 minutes of yelling at the kids to stop moving or keep their hands in the boat or not play rock the gondola, and I figured I can do all that for free. 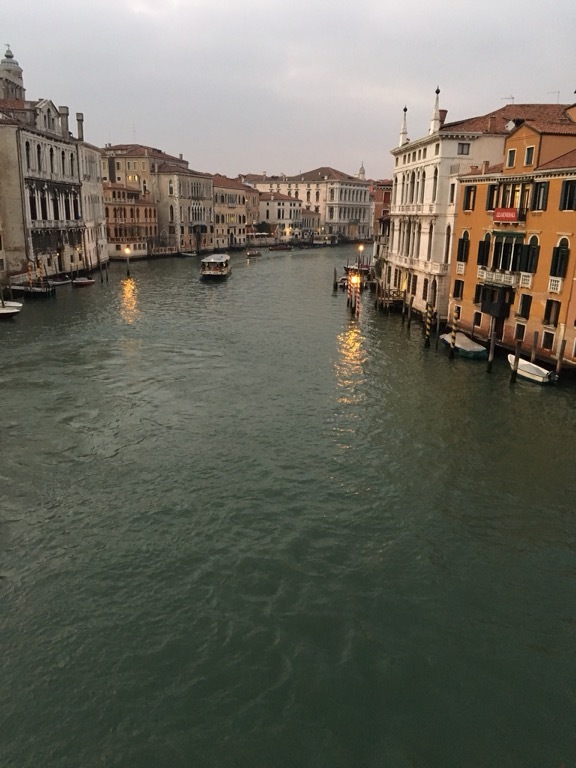 We did take a short gondola ferry ride, just for the feel of it. That evening we met up with a student of Eric’s who is currently studying in Bologna and had taken the train out to Venice to meet us and see some friends. 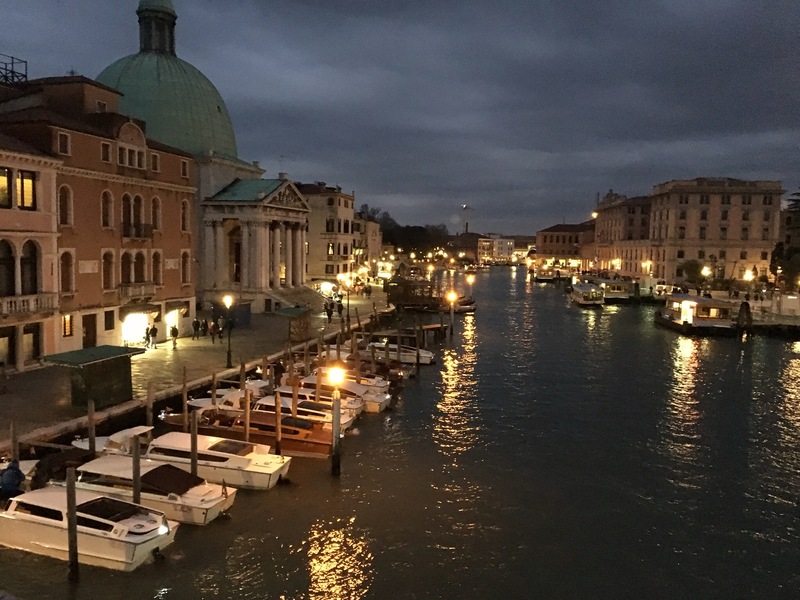 We asked around and were sent to a small street on an out of the way part of Venice where there were some (good) little wine bars, small and unpretentious and not facing a large boisterous pathway. This was my favorite part of Venice we’d seen yet. Away from the highly commercialized center (Disney Store, for goodness sake) and from the crowds of progressively more drunken tourists, you could sit in peace and have a beverage while looking out at the canals. So Venice, I may be back, I’m not sure. If so I’d stay further out of the main area, in the fringes where it retains its charm and some of its culture. 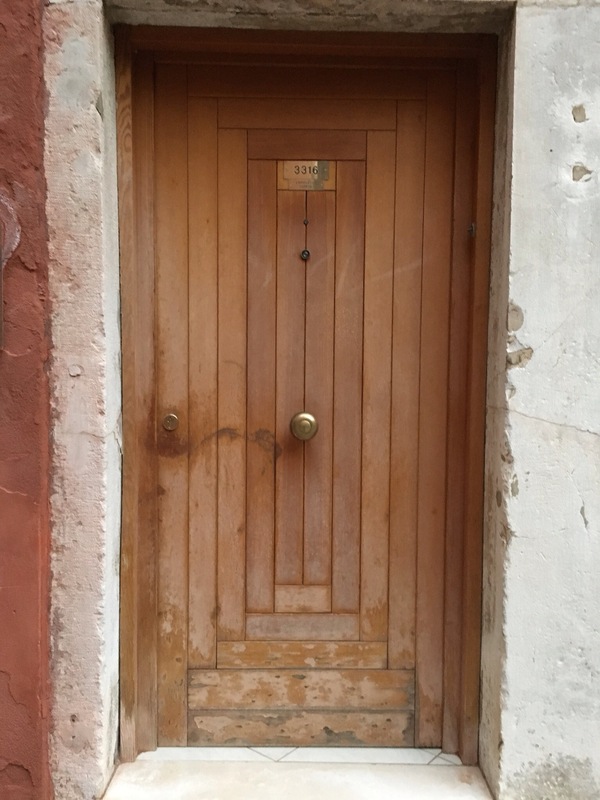 I’ll leave with my favorite detail about Venice, the doorknobs which are situated in the center of heavy wooden doors, like Hobbit holes.